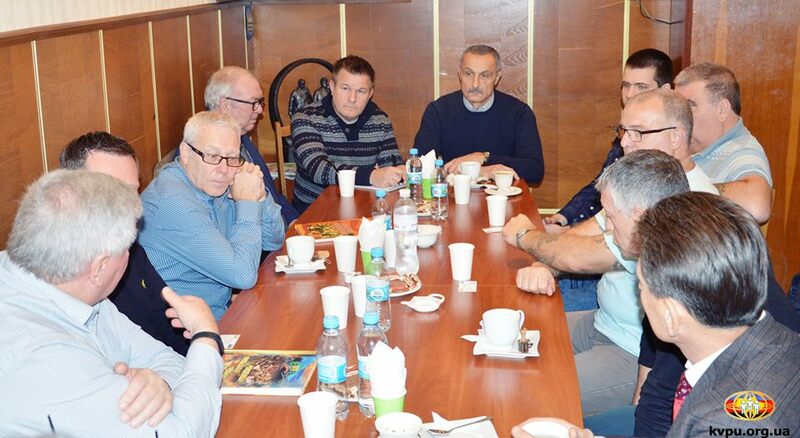 A meeting took place in Kyiv today between representatives of the Confederation of Free Trade Unions of Ukraine (KVPU), including the Independent Union of Miners of Ukraine (NPHU) and the Free Trade Union of Railway Workers of Ukraine (VPZU) with their colleagues from the National Union of Miners (NUM). The British trade unionists came to Ukraine in order to understand better the situation in our country, as well as to tell us about the current situation in Britain. Mick Antoniw, Member of the National Assembly for Wales and the member for Wales of the European Union Committee of the Regions, took part in the meeting. The British trade unionists frankly admitted that a lot of propaganda is circulating and that they are looking for reliable information about the situation in Ukraine and about the realities of life of Ukrainian workers. This is not the first time the British miners and transport workers have spoken out in support of Ukrainians at a difficult and tragic time for them. NUM representatives took part in the Third Congress of Miners of Ukraine (21 April 2015) and witnessed our miners protesting in the centre of Kyiv. Mick Antoniw recalled that trade unions in England organised a whole campaign of support for Ukraine. “We need to understand” he said “what’s happening in Ukraine. Its necessary to publicise the situation here in the UK. We also want to explain to you what’s happening in our country”. Mykhailo Volynets, head of the KVPU and the NPHU recounted to their guests that the independent unions came out onto the Maidan and took an active part in the Revolution of Dignity. At the same time the union leader noted that the changes everyone was anticipating did not come about because all available forces were sent into the defense of the country when Crimea was annexed and a part of the Donbas was occupied. “Unfortunately, we still have corruption here while GDP and Ukrainians’ living standards continue to plummet. People are becoming more and more disillusioned with the current government” said Mykhailo Volynets. “As well as that, many people have been forced by the occupation of the Donbas to flee their homes. The country has lost many of its enterprises, including coal mines. Mykhailo Volynets described the perilous state of the fuel and energy sector that has been created by the thoughtless policies of the government. He noted that the government’s proposed reform of the coal mining sector actually amounts to the closure of mines. First deputy head of the KVPU and NPHU Anatoli Akimochkin explained to the British guests the situation that has befallen the Donbas today. There are more than 90 mines in the occupied territories, the majority of which have stopped working. Ukraine has lost supplies of coal it absolutely needs, while the great majority of miners have been left unemployed. Anatoli Akimochkin added that in the so-called “Donetsk People’s Republic” and “Luhansk People’s Republic” independent trade unions are banned. 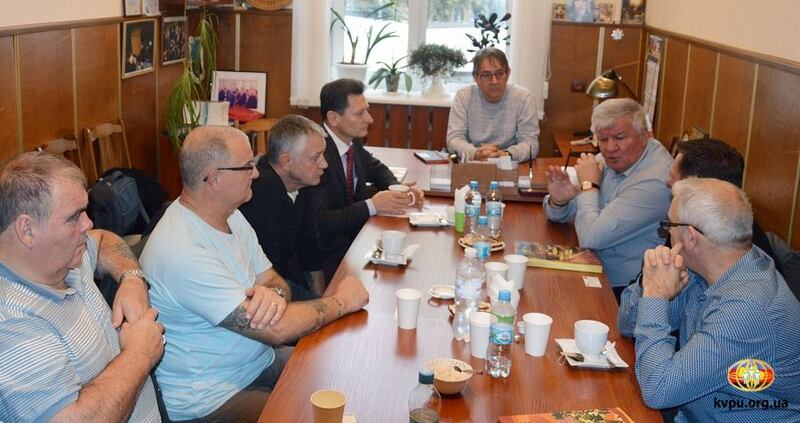 NUM President Nicky Wilson understands well the Ukrainian miners. Britain imports 80% of the coal it needs. Had the British mines not been closed when they were then they could be providing 90% of the UK’s needs. After all, coal accounts for over 30% of the generation of its electricity and thermal energy. Representatives of the Confederation of Trade Unions and the Independent Miners Union thanked their British colleagues for their support and they, in turn, for providing them with the information they were seeking. 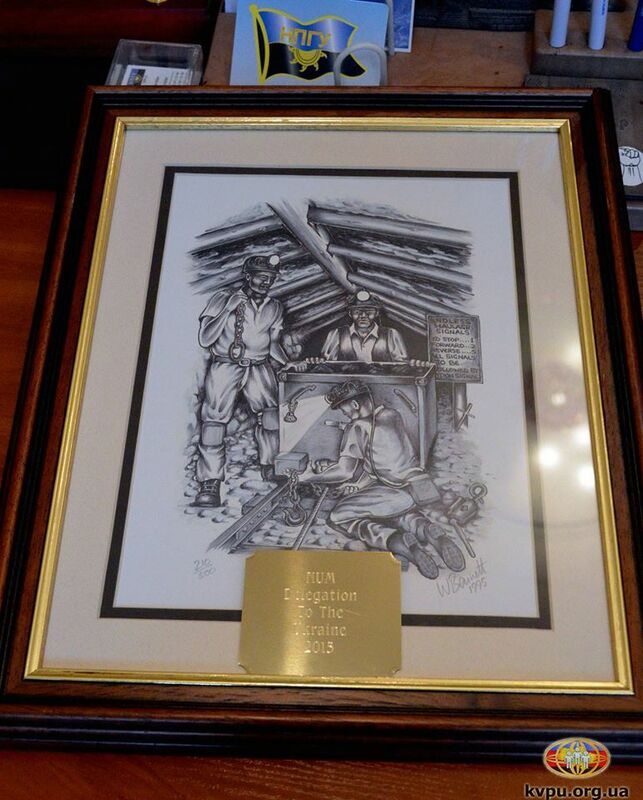 Nicky Wilson on behalf of the NUM presented Mykhailo Volynets with a painting. Next Send Birthday Wishes to Russia’s Ukrainian Political Prisoners!